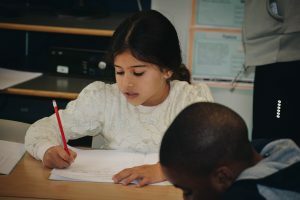 Our school is focussed on providing our students with the opportunities to develop their English and Maths skills so they can access the curriculum in their mainstream school. Primary schools have a pivotal role to play (Save the Children, 2012). Even small improvements, at this young age, will reverberate throughout the lives of our students and have an enormous impact on future attainment. Below are the achievements of our students for the last academic year. ……with all Reception and Year 4, 5 and 6 pupils improving. At the beginning of 2016/17 only 50% of all pupils were ‘not yet working at year group standard’. By the end of2016/17 this was reduced to 25%. All of our Year 4, 5 and 6 pupils assessed attained a ‘secure’ level in literacy by the end of the year – a tremendous achievement for this demographic. ……with almost 1/5 of pupils achieving a level of numeracy ‘beyond expectation’. …..50% of Year 4, 5 and 6 pupils were achieving the expected level of numeracy at the end of the year…..